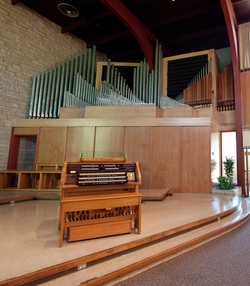 The All Faiths Chapel Memorial Organ was built by Austin Organs Inc. of Hartford, Connecticut. The dedicatory recital was played November 19, 1961 by Robert Baker, Director of the School of Sacred Music at Union Theological Seminary in New York City. The memorial organ contains 2,458 pipes grouped together in 40 ranks of pipes playable from three manuals and pedal. The organ was a gift from the alumni and friends of Kansas State University. Major gifts were made to perpetuate the memories of A.L. Duckwall, Ernest A. Nicolay, Mrs. Barbara M. Nicolay, and James Russell Garver, Jr. A new digital combination system was installed in 2007. The organ remains in original tonal condition. "A really great pipe organ is much more than the sum of its parts; it is not just a collection of pipes controlled by 'stops' that have, to the layman, strange and incomprehensible names; it cannot be bought 'by the yard' . . . so many pipes per cubic yard of space, or so many seats in an auditorium. The tonal design of an organ is based solidly on the physical laws which underlie the production and distribution of sound, and only a man who understands those laws as they pertain to organ pipes is qualified to design an organ. Such a man was James Blaine Jamison. He would have been a great designer under any circumstances, so it is only incidental that he spent many years with the Austin company. His book Organ Design and Appraisal, has been called 'one of the three most valuable books on this subject in the past two hundred years.' Mr. Jamison came to Manhattan, visited our chapel, and was very enthusiastic about it. Thereupon, he designed the organ, which he thought was 'the instrument containing the fewest number of registers which would be capable of the correct interpretation of all schools and periods of organ literature, both classical and romantic; also to fulfill adequately the requirements of the church service, leading congregational singing, accompanying choirs and solo voices and other music incidental to the service.' It must perform as an ensemble instrument in Chamber and Orchestral music, and it must be a capable solo (recital) instrument." The following quotations describing the All Faiths Chapel Memorial Organ come from Richard J. Piper, then Vice President and Tonal Director of Austin Organs, Inc. These words appeared in the organ's dedication recital program. "All Faiths Chapel was the last three-manual organ designed by Mr. Jamison and as such represents the culmination of his ideas and thoughts on the subject, and it is significant that he published the specificiation for this organ in his book. The builders have regarded the tonal work of this organ somewhat as a memorial to Mr. Jamison, whom they held in such high esteem. They sincerely believe that the instrument successfully fulfills his very great expectations and that were he here today, he would give his unqualified approval to the tonal interpretation. It is truly said that Time is the only yardstick by which beauty can be measured. Austin believes that this organ will endure. It is not often the organ builder enjoys such ideal conditions where his work can be heard to the best advantage. Due to the splendid cooperation of the architect, Mr. Chadwick, the organ has perfect placement. Mr. Chadwick was also responsible for working out with the organ builder the appearance of the organ and the arrangement of the exposed pipework. The organ has three manuals and pedal keyboard and consists of four divisions--Great and Pedal exposed and unenclosed and Swell and Positiv enclosed in Expression Chambers with 40 ranks and a total of 2,458 pipes. The console, equipped with all modern controls, is of the compact type. Mounted on a movable platform, it can be moved to any location most suited to the occasion. For recitals, the console can be moved to the center of the chancel where the player can hear all divisions in correct balance. The organ has been custom built to the highest standards to suit the acoustics of the Chapel and the fine exposed location. It has a freshness and charm obtainable only when conditions are right. There is an extremely wide range of contasting tone colors and none are duplicated. Of the many flutes in the organ, all are different; each has its distinct character, and while making the correct contribution to the ensemble, every register has individual beauty. The organ has a great flexibility and marked clarity. There is an exceptionally smooth build-up and a fine cohesion throughout its dynamic range from the delicate charm of the Positiv Dolces to the magnificence and and grandeur of the full ensemble." Wind Pressure: 3 3/4", Bombarde 6"